Over the last several decades there have been substantial yield improvements in soybean. Because of new varieties and new agronomic practices, the yield potential in soybean is higher now than ever before. 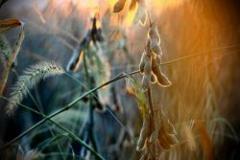 But a lack of updated information on the nutritional needs of soybean crops may be limiting the crop’s potential. Researchers from the University of Illinois Crop Physiology Laboratory led by Fred Below have recently provided an updated set of nutrition needs for soybean, identifying exactly which nutrients the plant needs, when those nutrients are accumulated throughout the season, and where the plant uses those nutrients. Through field trials over three years at sites in DeKalb and Champaign, the researchers determined that some of the crop’s nutritional needs may not be getting enough attention under current management practices, according to Ross Bender, a U of I doctoral candidate in crop physiology and lead author of the study. Bender said that one of the more important findings of the study is that there appears to be a significantly greater accumulation of nutrients during seed filling now than in the past. “Because we have a higher yield potential, our farmers are now producing more beans than ever before,” Bender said. “As a result, that high-yielding bean with a lot of nutrients concentrated in it has sort of influenced when some of the nutrients are accumulated. We have more grain developing later in the season, right before harvest, and that’s actually driving increased nutrient accumulation. “That’s one of the fairly interesting findings in that we see larger quantities of nutrient accumulation throughout the plant’s life cycle, but especially in the later-half of the season,” he added. To determine nutrient needs, the researchers measured nutrient accumulation throughout the course of the whole growing season. They measured macronutrients, including nitrogen (N), potassium (K), and phosphorus (P)—the primary macronutrients for soybean—and the secondary macronutrients magnesium (Mg), calcium (Ca), and sulfur (S). They also measured micronutrients that are needed in smaller quantities, including boron (B), copper (Cu), iron (Fe), manganese (Mn), and zinc (Zn). The two criteria used to estimate which nutrients may be most important were determining whether the nutrient had a high total uptake (nitrogen, potassium, phosphorus, and calcium were the highest), and finding the harvest index (HI) of each nutrient, or the proportion of total nutrient accumulation that goes into the grain. Nutrients with a high harvest index value means that most of what the plant takes up over the course of the season ends up in the grain. “If we want to produce more grain, and some nutrients are critical in making that grain, it stands to reason that maybe doing a better job of supplying the nutrients when the grain is being developed could help us improve yield,” Bender said. Instead, Bender said what farmers have traditionally done and what is common practice in Illinois, is to routinely supply large quantities of phosphorus (phosphate) before the corn crop, hoping that would be enough for that year’s corn crop and that enough would remain for the following soybean crop. “If farmers fertilize soybean, it’s probably only with potassium because there’s this notion that the only nutrient in soybean that’s important is potassium,” he said. “As a result, they might supply potassium before soybean but hope the phosphate [left after the corn crop] is enough for the needs of soybean. “What we see in this study is that there is a large accumulation of both of these nutrients, but we also see that there’s a season-long demand for phosphate, the nutrient that’s maybe ‘neglected.’ If a producer supplies that nutrient well in advance before their corn, with the hope that something will still be there 18 to 20 months later for that soybean crop, there is probably not as much there as they realize. But when we do fertilize with phosphate we see some fairly substantial yield improvements as a result,” Bender added. The researchers determined that phosphate (phosphorus) had the most potential to improve yield. The nutrient is accumulated during a 70-day period during the growing season, and is put into grain at the end of the season more than any other nutrient, Bender said. “How to supply phosphate when the plant needs it later in the growing season is one of the challenges,” he explained. In addition to phosphate and potassium, Bender said nitrogen, sulfur and copper also proved to be important nutrients for continued, high-yielding success. Nitrogen is most important at the end of the season because the grain contains a lot of protein which is made up of nitrogen. This is why soybean grain has been considered a good feed source. Bender said the higher the soybean yield, the more protein produced and the more nitrogen needed. Though nitrogen may not be considered an important nutrient, as soybean can obtain nitrogen from the air, the way the plant moves nitrogen from the leaf to the grain during the growing season (about 50 days straight) proves that it is a vital nutrient for making grain and increasing yield, he said. Sulfur is another nutrient Bender said should be considered for use as a fertilizer. Because less sulfur is provided from the atmosphere now, due to cleaner fuels, for example, less is deposited in fields on an annual basis. He added that sulfur, which is required in large quantities to produce grain, needs to be more efficiently managed. The micronutrient they determined to be the most interesting is copper because of its distribution to the grain (60 percent of plant copper is in the grain at the end of the season). “This, of all micronutrients, is the only one that exhibits this pattern of remobilization where the plant pulls it from one tissue and puts it somewhere else. We don’t know if this means that we need to fertilize with copper, because the plants don’t need to accumulate much of it, but it is interesting,” he said. With these changes in the soybean crop, such as the greater emphasis now on nutrient availability in August and September, Bender said that practices that supply nutrients right before the crop is planted and throughout the season really show promise to help producers. “Nutrient Uptake, Partitioning, and Remobilization in Modern Soybean Varieties,” was recently published in Agronomy Journal and can be accessed online at https://www.agronomy.org/publications/aj/articles/107/2/563. Co-authors of the study include Ross R. Bender, Jason W. Haegele, and Frederick E. Below. Funding for the research was partially provided by The Mosaic Company.